Molly Bruce (“Brucie”) Jacobs has studied encaustic painting with the encaustics painter Ellen Koment in Santa Fe, New Mexico. 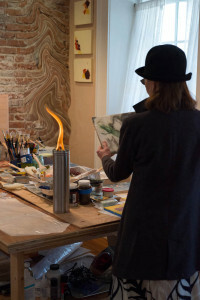 In addition, she recently participated in an encaustics workshop in Malaga, Spain, which was taught by Ellen Koment and the artist Belen Millan. Jacobs learned about making encaustic monotypes during workshops run by Paula Roland of Santa Fe, New Mexico. She has also studied at the Silvermine School of Art (New Canaan, CT), as well as with Cynthia Winika at R & F Handmade Paints, Inc. (Kingston, NY). She has taken oil pastel lessons with John Elliot, former head of The Oil Pastel Association. Having studied film photography with the photographer, Garrison Adams, Jacobs takes many of her photographs with a Leicaflex film camera. She is largely self-taught in digital photography. Jacobs has been represented by the WIT Gallery (Lenox, MA), St. Francis Gallery (Lee, Ma), Lauren Clark Fine Art (Housatonic, MA), Sanford Smith Fine Art (Great Barrington, MA), The Hanback Gallery (Millerton, NY), Cose D’argilla Fine Italian and Contemporary Art (Lenox, MA), The Coastal Frameshop and Gallery (Rehoboth Beach, DE), and Galleria Tango (Rehoboth Beach, DE). Jacobs had a solo exhibition of her Macrovision and Skyscapes series at Sanford Smith Fine Art in 2010. Her work was included in an exhibition of Art Works on Paper sponsored by the Lichtenstein Center for the Arts (Pittsfield, MA) in 2010. She has exhibited in several group shows in Rehoboth Beach, DE. A selection of her work was selected for the Annual Juried Rehoboth Art League Exhibition in 2006. Jacobs’ art can be seen at the Museum of Encaustic Art in Santa Fe, NM. Brucie Jacobs is not only a painter, but also an author. For information about her publications, visit Books. Born in Baltimore, MD, Jacobs graduated from Cornell University with a BA in Asian Studies. Afterwards she went on to receive a law degree from Columbia University. She recently moved from western Massachusetts to Santa Fe, New Mexico.